Our repeaters are believed to be the only repeaters situated on a medieval building in Europe. The antennas are sited on top of the central tower of Lincoln Cathedral. This magnificent building, which was started over 900 years ago, dominates the City from its elevated position. 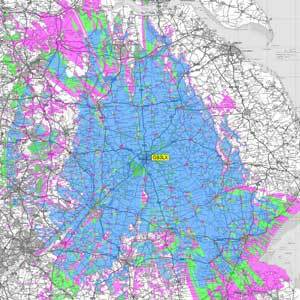 The repeaters have a good coverage area which takes in Lincolnshire and East Nottinghamshire. If you would like to make a donation to help with the cost of the upkeep of these repeaters, it would be gratefully appreciated. Our Repeaters are available for all amateurs to use. 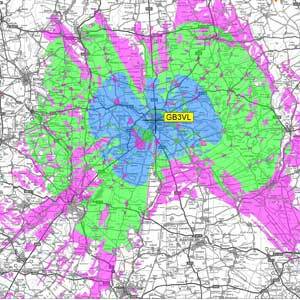 Please remember to leave a pause between transmissions to allow other stations to call in. This repeater has a Quad Screen mode which is automatically entered into when mutiple input signals are detected. Join in with natter nights on a Friday or Saturday @ 19:30 GMT. Please check the BATC Stream Chat for updates. This repeater also acts as an input for GB3VL. There are others that work in the background that are not committee members. Including M5SJM - Stephen (website admin). Thanks Go to James M0JGX, The original creator of this website. If you would like to make a donation to help with the cost of the upkeep of these repeaters, it would be gratefully appreciated. If you have donated in the last year and would like "Supported" status on the forum and to be listed below please contact us. If you have any questions please contact us by clicking here. Or join our Facebook Group to ask questions and see out latest news.